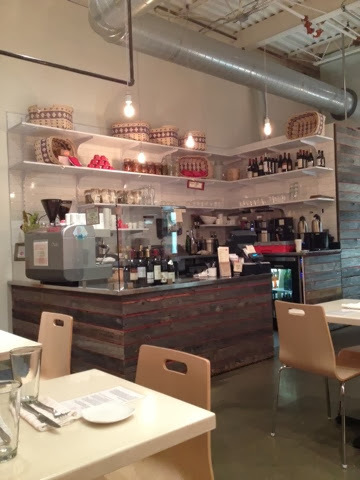 Sometimes you find yourself driving through the city, hankering for a little bite to eat, and suddenly stumble upon someplace wonderful. That happened tonight. Mom and I were looking for a place to stop and saw a clump of patrons leaving the Lynn on Bryant and asked how it was...they said it was a place we shouldn't pass up! In that case, let's get in there! The attention to detail in this place was beautiful and after speaking with the owner/chef, they put the greatest care into creating the perfect ambiance. 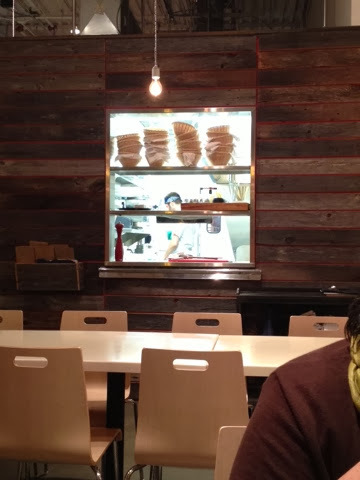 A window into the small kitchen to watch your dish be made. And if you can't clearly see, the walls were painted a fire-engine red with wood planks atop so the red could peak through. Added just enough color without overwhelming the dining area. 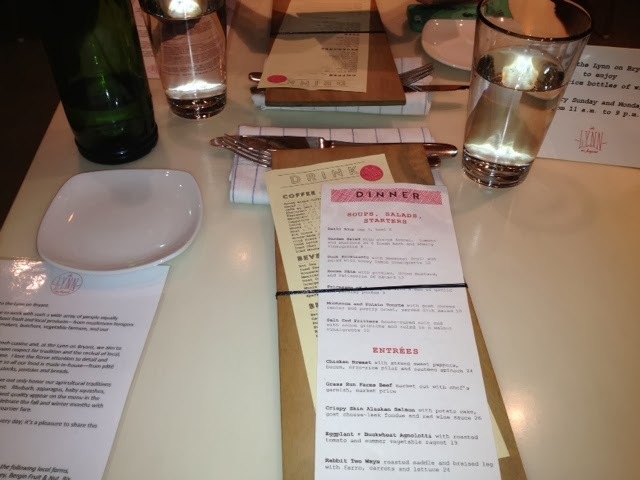 The table and menu remained simple but pleasant with a number of terribly tempting options. Their design is to create plates that bring their patrons closer to the farmers, meaning, they source their food locally. Quite the trend in restaurants these days. Minneapolitans love their local food...about as much as those in the Pacific Northwest. If you have seen Portlandia, you ought to be chuckling to yourself. The food was tasty. 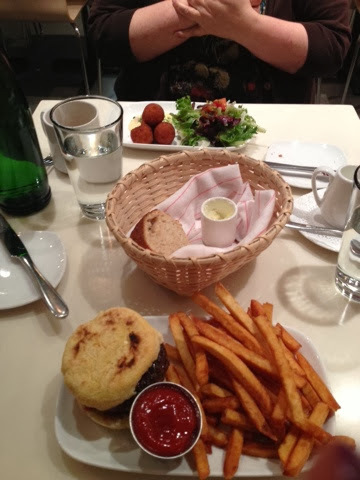 We had a few suggestions for the chef (along the lines of dense grass-fed beef...he took them gratefully) but with exceptional atmosphere and service, we knew we would be back to try different plates from the menu. To add light in the dim, back dinning room, the owner/chef of Lynn on Bryant had an artist create this lit wall. Instead of adding more light fixtures, they stayed within their design concept to keep a continuous atmosphere throughout the whole place. The more costly Edison bulbs were also a beautiful touch. 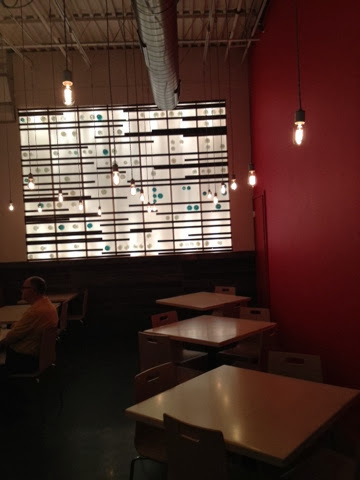 By mixing different shapes of bulbs throughout the restaurant, they kept a whimsical feel throughout. And the finishing touch? 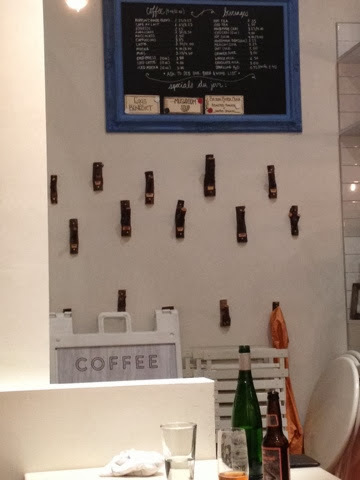 A wall of hooks made from tree branches. That's when you know you're in Minnesota. Well, that, or a wind curtain made of velvet....but that's a story for another day.